Card: Nine of Wands – from the Fairy Lights Tarot by Lucia Mattioli. Message from The Faeries: This card is our reminder to you, this week, that you are never alone. Even though it may sometimes feel like you are an island, out there in the world by yourself, you are not. 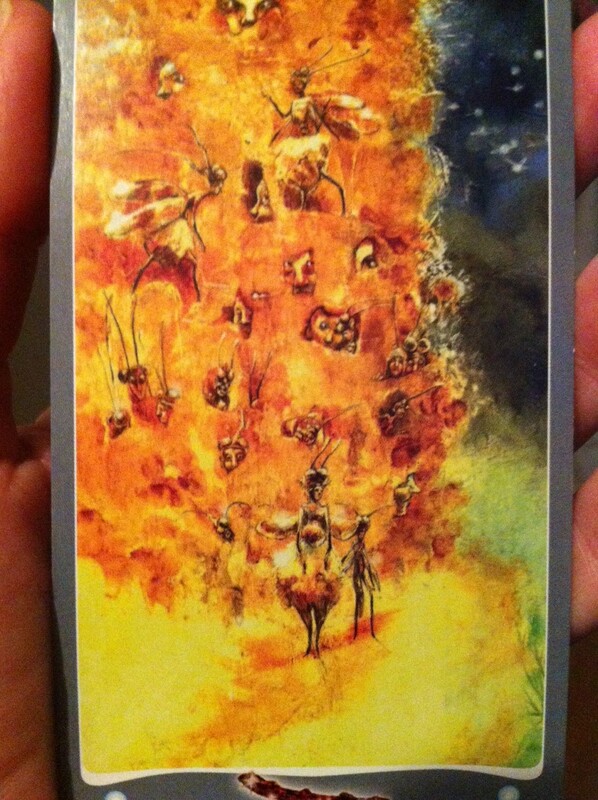 The imagery of this card is of a bunch of honey bee faeries that all inhabit this wonderful hive. They belong, and work together, in there own little microcosm. If you were to put them under a microscope, you would see that they have tiny little beings living on them, working and living together. And if you were to look under an even more powerful microscope you would that these tiny living beings have micro beings living on them….and so and so forth. Then you can zoom out and you can see yourself standing there, all alone. But are you really all alone? Nope! Not a chance! You are this being living on Planet Earth, and whether you see it or not you are living side by side with countless other beings, let alone humans, on this planet. You can not ever be alone. Your life is always, at any given moment, intrinsically intertwined with everything and everyone that surrounds you. Your life has deep value and meaning. Each hive is a work of perfection. There is just the right number of bees, making just the right amount of honey, at all times. There is no such thing as a bad hive or a mistake bee. The hive is like a smaller version of Earth. Earth is always in a state of perfection. There is just the right amount of organisms living on the planet, all doing the right things at the right times – and there is no such a bad animals, bad plants or bad people – there are no mistakes. And everything is all working together at all times. So, whether you like it or not, you are never alone. You are always part of something, both greater and smaller than yourself. When you feel alone, you have disconnected yourself from the world around you. When you are disconnected, you are not living in harmony. This card is reminding you to stay connected. Thank you so much for your wise and detailed card description . Very impressive! So I translated it into Russian, as proof that we live and work together on our planet Earth. And we are in touch.